Rose & Thistle brings together a collection of some of the best culinary minds in the Toledo area, spearheaded by our very own Executive Chef, Matt Gustafson. Chef Matt has hand-picked each member of our staff, for their unique talents and ability to bring our beautiful and intricate menu to life every night. From our most simple appetizers, to our refined main courses, our kitchen is capable of creating some of the most breathtaking and delicious dishes in the Toledo area. An Ohio Native, Matthew Gustafson was raised in Southeast Michigan. Chef Matt’s passion for the culinary arts started at a very young age. He has fond memories of baking with his mother as a young child and always being a part of dinner preparation. As he went through the typical phases of education and part-time jobs, his sights were set on careers like computer programming, psychology and photography. While one of his first after school jobs was at a local pizzeria, he soon became imbedded in the restaurant business from delivering pizzas to making them, and then moving on to other restaurants where he spent most of his time working in the kitchen. After high school and a couple of years at Central Michigan University with mainstream academia in the forefront, he knew what he was meant to do and soon after enrolled in culinary school at Schoolcraft College where he had the privilege of training under the world’s few Certified Master Chef instructors. Chef Matt gained extensive pastry and sous chef experience from his time at a major Michigan country club and popular Detroit area restaurant. 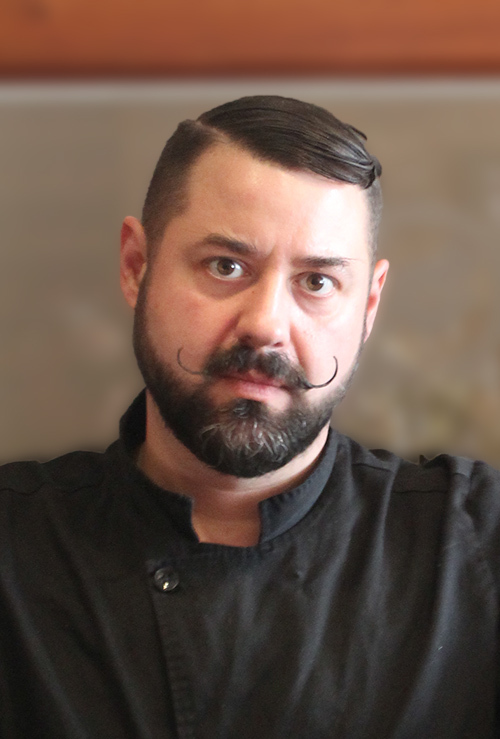 In 2004, he had the opportunity to relocate to Perrysburg and bring his unique culinary talents to a popular local restaurant as an executive chef. In 2010, he partnered with his friend and culinary mentor, the late Lee Tebbetts, at The Rose and Thistle in historic downtown Perrysburg as executive chef and owner. It was the culmination of two great chefs with very similar training in French cuisine and similar beliefs in customer service that allowed The Rose and Thistle to evolve into what it is today. Chef Matt’s creations start with the very basic definition of mise en place, the French phrase used in professional kitchens to refer to the organizing and arranging of ingredients needed to prepare a meal. To Chef Matt, the ingredients must be fresh and the dish must be true to the ingredient. He creates his dishes with an appreciation for the pure, authentic value of the product. Born and raised in Toledo’s vistula neighborhood, growing up with regular family meals, special events like birthdays and holidays or family reunions, Ian Regent was in the thick of it with food preparation from a very young age. His grandmother was a very inclusive woman who cooked for the masses. His first paid job in the business was making dough at the Original Gino’s on Monroe Street and on to the other stores as well. The Navy Bistro at the docks in Toledo was the next stop for Ian’s culinary journey and then headed up river to help kick off the opening of Perrysburg’s Stella’s and then right back down river to the Maumee River Yacht Club. This is where Ian got his wings as a chef running a smaller, full service dining room. Keeping with the nautical flare, Ian headed next to the historic Toledo Yacht Club. It was from there Ian went to Manhattans in Toledo where he gained a wider view of food which ultimately lead him to accelerating the learning process to accommodate the diversity of the clientele. He embraced many different cuisines: Spanish, African, German, Polish, Filipino and many others. This enabled him to create and build his unique, culinary personality; combining his foundation of French based cuisine with a variety of styles. Simply put, you can describe Ian’s philosophy when it comes to food by rolling back the clock to his earlier days as a child watching his grandmother prepare and provide food for family and friends and community. This is where the commonality of Matt and Ian aligns. Neither one supports flipping tables over what’s best for the guests. Their guests are encouraged to progress through a meal at their own leisure, with every course an experience, hopefully leading to an OMG, this is delicious memory or when can we come back here feeling. Pure, authentic food and classic techniques; sharing his talents with guests is what draws him to the idea that what is created in the kitchen can be immediately judged by the guests as an artistic expression and hopefully create a memorable experience for them. Our founder Lee Tebbetts was a native of New York, educated in New Hampshire; and a Dartmouth College graduate with a passion for architecture. He began his career working on the restoration of old houses in New England. It was during that time he became acquainted with a New York architect who specialized in designing restaurants. As he worked closely with restaurant designs and renovations, it became apparent his passion was cooking. Soon after, he attended and graduated from The Culinary Institute in Hyde Park, New York. Having combined his true loves, he transformed a turn of the last century storefront in historic downtown Perrysburg into The Rose & Thistle Pub & Restaurant. The restaurant successfully opened in 2001. 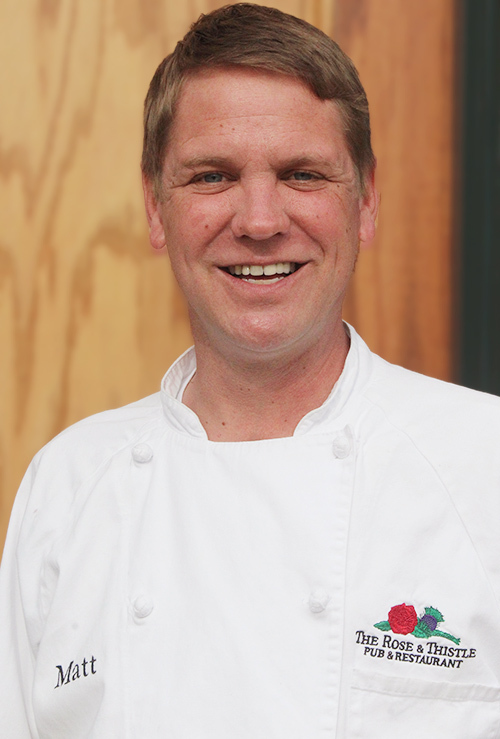 Over a few short years Lee hired sous chefs and provided them with one-on-one culinary knowledge and experience. Several of those sous chefs left the Rose and Thistle to attend and complete culinary school themselves; all thanks to Lee Tebbetts sharing his gift, his mentoring and encouragement. In 2004 when Matthew Gustafson moved to Perrysburg from Farmington Hills, Michigan, it didn’t take long for him and Lee to become acquainted and become fast friends. Lee counted on his favorite lunch being prepared by Chef Matt at nearby Stella’s even when it wasn’t on the menu. They shared a nearly identical opinion about food, cooking and the style in which to provide for others. They were a natural fit. As Lee’s health deteriorated it lessened the time he could spend hands-on cooking. He would randomly receive offers from people to buy the restaurant or requests to work with him; all of which he declined. It was a late night in December of 2009 when the two chefs sat together chatting about business theories, creativity and their common ground of providing “good, honest food…” prepared without the cover-up of fancy trends or ready-to-heat sauces. The two sounded as if they were talking about a dream. But before they went their separate ways, Lee shook Matthew’s hand and suggested they continue the conversation….and just like that, after many previous offers, he hand-picked Matthew to become his partner in business and the one to carry on his dream. They planned and schemed for months until they sealed the deal in May of 2010. Lee passed away far too soon in 2014, leaving his legacy, his passion and love for providing a beautiful, comfortable place for friends and family to break bread together. As now sole proprietor, Matthew is devoted to carrying on Lee’s legacy at the Rose & Thistle and continues to provide a place for people to enjoy each other’s company and conversation, sharing a memorable meal without the distraction of televisions or loud entertainment. Guests are treated like family in his home and are welcomed to stay at their table to continue conversation or after dinner drinks. It only takes one time dining with The Rose and Thistle to make you feel like family.